This week-end hubby desired to eat Rasmalai- he normally never demands for anything(eats whatever I give...:), so I had to make this. For the rabdi, you have to heat milk and get it to half it's consistency. Bring it to a boil once and then keep it on simmer till it reduces to half the original amount, keep stirring ocassionally. Once it is half, add sugar and cardamon and refrigerate. For the malai, I did not have any cheese so I decided to make it, for this I boiled milk and then added lime juice while stirring it, I could see the cheese or paneer getting seperated. Once the milk became to a watery consistency I added some ice-cubes in that to stop the process of churning. 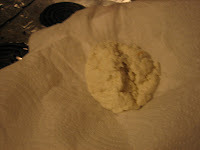 Then ideally the cheese formed has to be drained and kept in a muslin cloth it to loose it's mositure, but as I did not have any xtra cloth I used tissue papaer to drain the water off and as I am not very patient I left it only for 10 minutes. This is how the cheese looked. I made round balls of the cheese. Now in another vessel I heated water and added sugar and cardamon. When it is boling hot add the cheese, cover and cook for 5 minutes. Make sure that the sugar and water mixture do not form a thick syrup but remain a watery consistency. 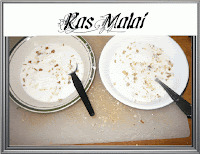 The cheese enlarges in the water, after 5 minutes take it out in a dish, pour the rabdi on it, refiregerate and serve cold.